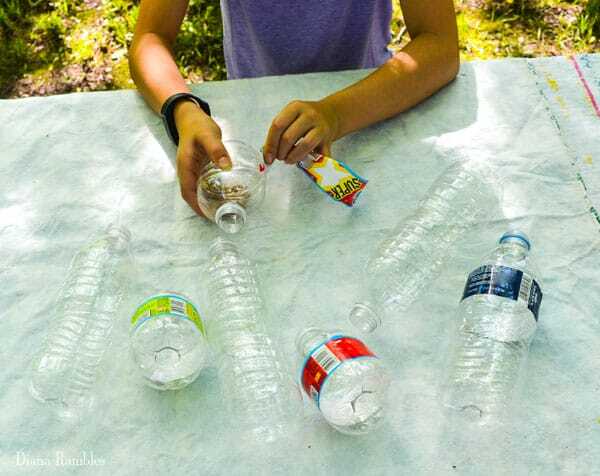 Here is a fun water bottle outdoor craft. These wind spirals are fun to make and pretty to look at. Before a recent camping trip, my daughter and I decided to do a craft. I wanted to make something to decorate our campsite with. 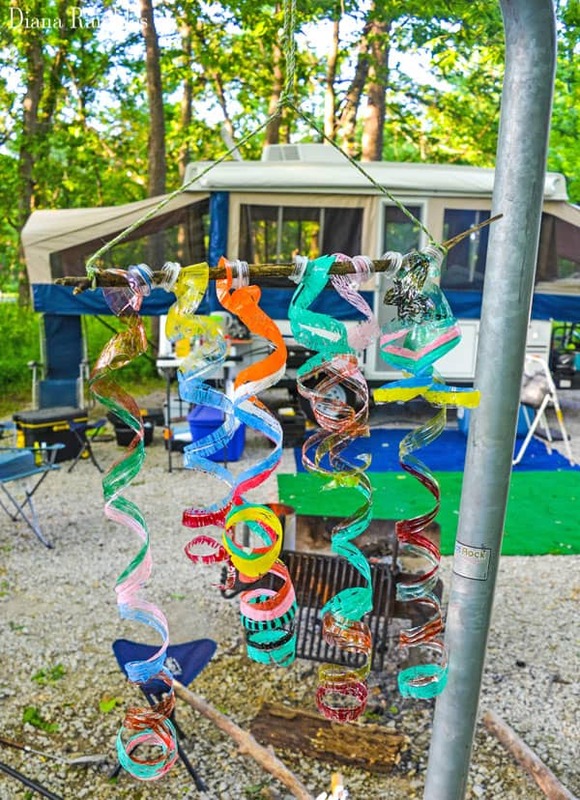 A wind chime crossed my mind, but I remember seeing some colorful spirals hanging on someone’s campsite on our last trip. I figured out that they were made with empty water bottles and some kind of paint or ink. We tested some permanent marker on wa plastic bottle at home before we packed and realized that they will work. Prepping this craft was quite easy! I just grabbed some water bottles and our bag of permanent markers. Remove the caps from the water bottles and let them dry out. Remove any labels from the bottles. 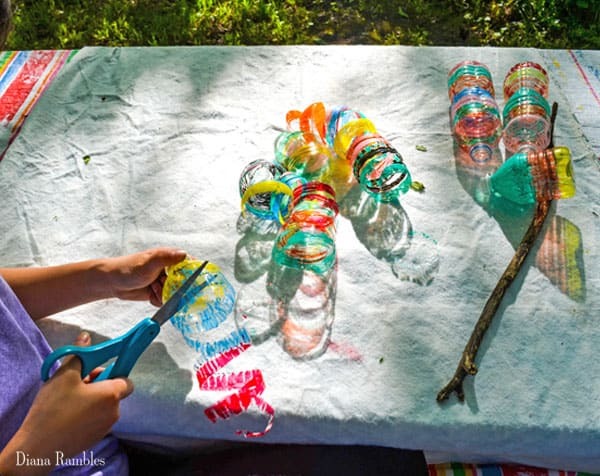 Using the permanent markers, color the bottles with various colors and designs. We did rings around ours. Cut the bottom off the water bottle and recycle it. 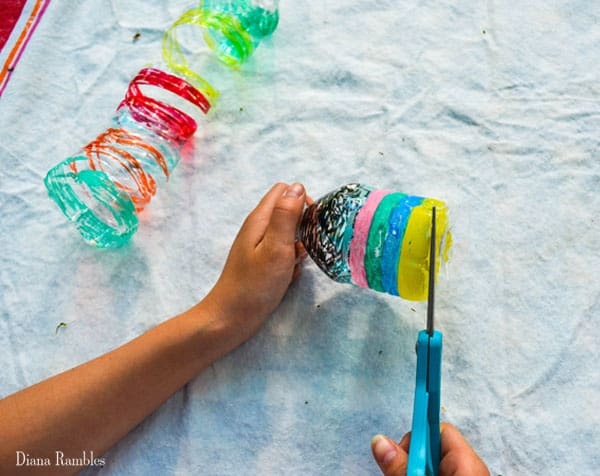 Starting at the bottom of the bottle, cut a spiral up and around the bottle until you reach the spout area. Our were around 1″ wide. We cut a little thicker on a few of our smaller bottles and then cut those spirals in half for extra twirls. Place the spout opening of the bottles on a stick. We alternated the placement of ours to keep the bottle spread out a little bit. Since we had short and tall bottles, we alternated them tall, short, tall, short, tall, short, tall. Tie a string or ribbon loop to each end of the stick and hang the spiral. Enjoy it blowing in the wind! This is so pretty with the afternoon sun shining through them. I took this video, but the lighting kept changing. You can see how pretty the spirals are, though. 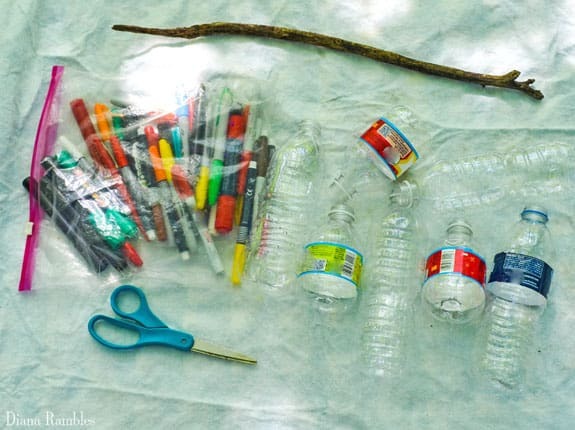 Do you have any outdoor crafts you like to make? I’m always looking for new ideas when we are out camping. This post first appeared on Diana Rambles on 13 June 2016.